The concept of Limbo--a region on the edge of hell (limbus means "hem" or "border") for those who are not saved even though they did not sin--exists in Christian theology by Dante's time, but the poet's version of this region is more generous than most. Dante's Limbo--technically the first circle of hell--includes virtuous non-Christian adults in addition to unbaptized infants. We thus find here many of the great heroes, thinkers, and creative minds of ancient Greece and Rome as well as such medieval non-Christians as Saladin, Sultan of Egypt in the late twelfth century, and the great Islamic philosophers Avicenna (Ibn Sina) and Averroës (Ibn Rushd). For Dante, Limbo was also the home of major figures from the Hebrew Bible, who--according to Christian theology--were "liberated" by Jesus following his crucifixion (see Harrowing of Hell). 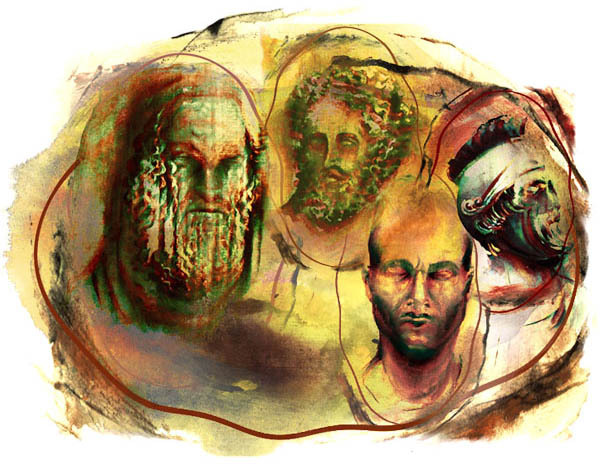 Among the magnanimous shades in Limbo is a distinguished group of four classical poets--Homer (8th century B.C.E. ), Horace (65-8 B.C.E. ), Ovid (43 B.C.E. - 17 C.E. ), and Lucan (39-65 C.E.) --who welcome back their colleague Virgil and honor Dante as one of their own (Inf. 4.100-2). The leader of this group is Homer, author of epic poems treating the war between the Greeks and Trojans (Iliad) and Ulysses' adventurous return voyage (Odyssey). Although Dante had no direct familiarity with Homer's poetry (it wasn't translated and Dante didn't read Greek), he knew of Homer's unsurpassed achievement from references in works by Latin writers he admired. Dante knew works of the other three poets--each wrote in Latin--very well, particularly Ovid's Metamorphoses (mythological tales of transformations, often based on relations between gods and mortals) and Lucan's Pharsalia (treating the Roman civil war between Caesar and Pompey); Horace was best known as the author of satires and an influential poem about the making of poetry (Ars poetica). The vast majority of characters and allusions from classical mythology appearing in the Divine Comedy derive from the works of these writers, primarily those of Ovid and Lucan in addition to Virgil. This event is the supposed descent of Christ--following his crucifixion-- into Limbo, when he rescued and brought to heaven ("harrowing" implies a sort of violent abduction) his "ancestors" from the Hebrew Bible. Virgil supplies an eye-witness account, from his partially informed perspective, in Inferno 4.52-63. Since, according to Dante's reckoning, Christ's earthly life spanned thirty-four years, the harrowing can be dated to 34 C.E. Only suggested in the Bible, the story of Christ's post-mortem journey to hell appears in apocrypha--books related to but not included in the Bible--such as the Gospel of Nicodemus. So prominent was this story in the popular and theological imaginations that it was proclaimed as church dogma in 1215 and 1274. Dante's version of the harrowing, as we see from repeated allusions to the event during the protagonist's journey, emphasizes the power--in both physical and psychological terms--of Christ's raid on hell. "The master of those who know" (Inf. 4.131). So respected and well known was Aristotle in the Middle Ages that this phrase is enough to identify him as the one upon whom other prominent philosophers in Limbo-- including Socrates and Plato--look with honor. Dante elsewhere follows medieval tradition by referring to Aristotle simply as "the Philosopher," with no need of additional information. Aristotle's authority in the Middle Ages owes to the fact that almost all his works were translated into Latin (from their original Greek and / or from Arabic) in the twelfth and thirteenth centuries. By contrast, only one work by Plato--the Timaeus--was available in Latin translation (partial at that) in Dante's day. A student of Plato's, tutor to Alexander the Great, and founder of his own philosophical school, Aristotle (384-322 B.C.E.) wrote highly influential works on an astonishing range of subjects, including the physical universe, biology, politics, rhetoric, logic, natural philosophy, metaphysics, and ethics. Next to the Bible, he was the most important authority for two of Dante's favorite Christian thinkers, Albert the Great and his student Thomas Aquinas, both of whom strove to validate the role of reason and to sharpen its relationship to faith. The influence of Aristotelian thought on Dante is perhaps most apparent in the content of a philosophical work (Convivio), the argumentation of a political treatise (De Monarchia), and the moral structure of hell (Inferno). Consider Virgil's behavior and his psychological / emotional state in Limbo, in particular the effects on Virgil of the Harrowing of Hell (4.52-63). What does this canto tell us about Dante's attitude toward Virgil? What are the implications of Dante's self-identification as "sixth" among the great poets (4.102)?